My treadmill has sat lonely for the last month. Between strep throat and a stomach bug I was sick for almost 4 weeks. Not fun and it has thrown off my normal eating and exercising schedule. I am a creature of habit, when I don't eat well and get in my hour of treadmill everyday I get tired. Not just a little tired, but exhausted by the middle of the afternoon. When I eat a balanced diet and do my walking I feel energized and great. That's not to say I don't love an occasional treat. I have a definite sweet tooth and believe in using moderation. Since I eat gluten free I am always looking for ways I can have a treat and use gluten free flours. Last week I tried a new recipe for Peanut Butter Oatmeal Cookies from Allrecipes.com. This recipe has 10 ingredients. It takes 1 hour of total time, 15 minutes of which is active and makes 4 dozen cookies. I did make a few changes to the original recipe. First since I eat gluten free I substituted rice flour for the all-purpose flour. I have started buying a superfine brown rice flour that I love. It isn't gritty at all and I was able to fine a great deal on it making it affordable. Chocolate peanut butter was on sale at my local grocery store so I had a number of jars in my cupboard. I substituted the chocolate peanut butter for the regular peanut butter used in the recipe. Finally, I used an extra cup of oats since my family likes lots of oatmeal in their oatmeal cookies and I made my cookies larger than the recipe suggested. My baking time increased by a couple of minutes per batch and I ended up with a total of 2 dozen cookies. My husband and two boys aren't big fans of gluten free baking. However, they really liked these cookies even though they were gluten free. 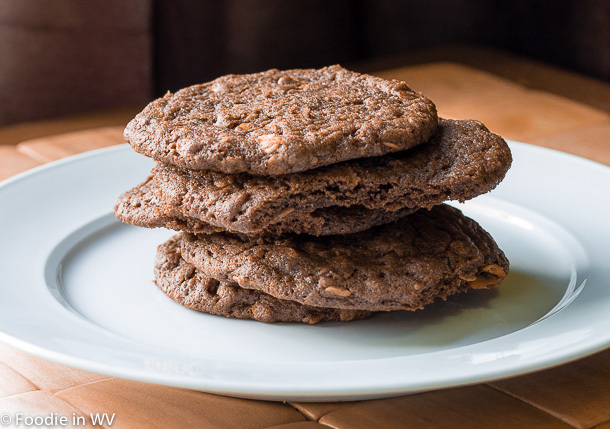 The combination of the chocolate peanut butter and oatmeal was delicious and I liked that they were baked unlike one of my husband's favorite recipes which is similar, but made as no-bakes. Overall, a great recipe that converted well to being made gluten free. For the recipe go to Peanut Butter Oatmeal Cookies. When I am active, and eat right I feel my best. I am glad you are feeling better. These cookies look delicious. I like the idea of chocolate peanut butter. I am feeling much better, thanks :) Chocolate peanut butter is great, I love it! Oh yumm!! Caught my attention! I am stopping by from the In and Out of the Kitchen link party! Thanks :) Going over to check out your page now! Nice, I had to read this right before bed time and now I want cookies! Hope you are feeling better. Strep throat is no fun! I am feeling better, thanks :) I always am ready for cookies! Thanks for the pin :) I am trying to eat healthier also, we'll see how long it lasts! Oh boy, oh boy - One of my favorite kinds of cookie. Those look delish, too! Glad you're feeling better! And these look yummy, gluten free or not! Definitely trying! These look delicious! Nothing better than the combination of peanut butter and chocolate. Yum! Thanks :) I agree peanut butter and chocolate together is great! I am feeling better, thanks :) I'm glad that you are feeling better also! Thanks :) They really are great! Pinned these! Thanks for linking up at Family Fun Friday.